Finally the day had arrived when we would say goodbye to Asia and hello Europe. This was going to be the very first time that any of us had set foot in Europe and we were most excited; although not looking forward to the 11 hour flight. The 1st of June is Children’s Day in China. We were due to fly to London today but changed our flight plans so that we could experience Children’s Day in China. We had no idea exactly what Children’s Day was all about but since we were travelling with two chidren we thought it was a good enough reason to find out! Day 116 Great Wall of China Day! Day 115 Peking Duck Day! Our day didn’t start with Peking Duck but certainly ended with it. How could we come this far and not try the signature dish?! We asked at the hostel to recommend somewhere local to eat duck and they recommended a restaurant about 2 km away. 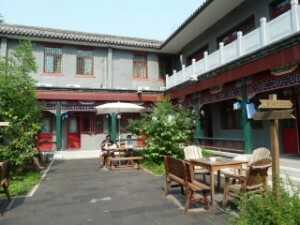 We set off with a piece of paper in hand with a basic map and the restaurant name in Chinese and pinyin ‘Jin Ba Wan’. Day 113, You can’t fly a kite in Tiannamen Square! 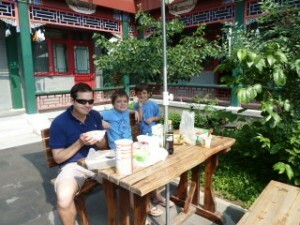 We had to see Tiannamen Square and the Forbidden City as they are both must do attractions in Beijing. Our day started with a lovely breakfast in the hostel courtyard and then we were off again to the train station. We woke to our first full day in Beijing and enjoyed a leisurely breakfast in the hostel’s serene courtyard. The hotel/apartment complex we were staying in had an adjoining restaurant. Here they served a good buffet breakfast. Our room came with one breakfast – yep, one. Useless for a family of four so we asked if we could use our 4 days of breakfast so that we could all eat together one day. So, that is how we started this day, all eating a hearty breakfast together.